Great Gift Lot!! Toy AND Patent Art Lot: 1963 Split-Window Chevy Corvette Sting Ray Stingray, Hotwheels, 2008 All Stars, Mint on Card, Awesome metallic purple with orange side striping colored vehicle, 1/64 scale diecast metal body, well done, (about 3" long). 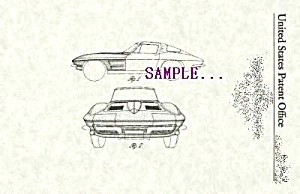 We've coupled this great lot with the Patent Art for 1963 Corvette described below. (It's matted ready to be popped into a standard 8 x 10 opening frame.) Great gift Lot. 1963 would see the introduction of a new "Sting Ray" coupé with a distinctive split rear window and faux hood vents. The C2 was designed by Larry Shinoda under the direction of GM chief stylist Bill Mitchell. Inspiration was drawn from several sources: the contemporary Jaguar E-Type, one of which Mitchell owned and enjoyed driving frequently; the radical Stingray Racer Mitchell designed in 1959 as Chevrolet no longer participated in factory racing; and a mako shark Mitchell caught while deep-sea fishing. Zora Arkus-Duntov ("father of the Corvette") disliked the split rear window (which also raised safety concerns due to reduced visibility) and it was discontinued in 1964, as were the fake hood vents.